The VonShef Electric Milk Frother is another budget priced frother. However, the quality and solid feel of this machine is noteworthy. At only $34.99 with free shipping on Amazon, you get, yes, a very basic model in terms of function, yet a high quality frother. The VonShef Premium heats milk to 150 degrees, a temperature that is mid-range for frothing. Two whisks come with the unit—one plastic head that stirs the milk while it is heating and one wire head that whisks for the actual milk frothing. These whisks snap in and out readily for easy setup. 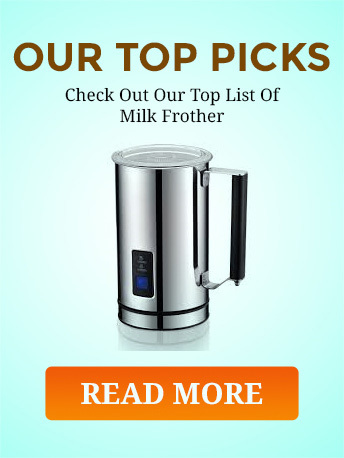 The Premium Milk Frother produces just 4 ounces of froth or less. And 8.5 ounces or less of heated milk. It has a smaller and more compact design with dimensions of only 5.5 inches x 6.5 x 8. The weight at 2.6 lbs. is below that of other frothers even though its materials are high grade stainless steel with minimal plastic parts. It’s a frother that froths with speed, too. In 1 minute and 5 seconds you have froth. VonShef has made this frother of double-walled stainless steel. Thus, it’s safe in terms of construction for working around heat. And its lining is of a long-lasting finish. Touch one button to froth or merely heat milk. A light comes on when the milk is ready to add to your coffee. And the container does keep the milk warm for an extended time after heating and frothing. This model, too, is cordless and so portable. The cord is connected to the base—a base that turns or swivels a full 360 degrees. And its automatic shut off is another built in safety provision. 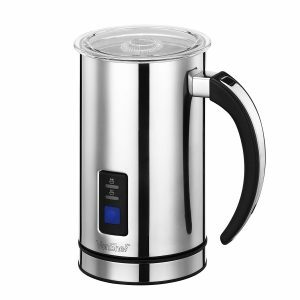 VonShef is a company that offers products for the modern kitchen such as coffee machines including this frother, food preparation appliances, cooking appliances, kettles and toasters, ovens / cookers, and other large appliances. Their products demonstrate good innovation and design. And they are built to be utilized for years. 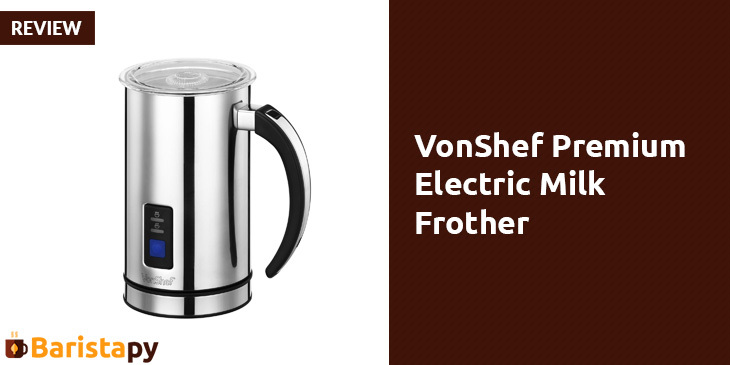 VonShef backs its Premium Electric Milk Frother with a 1 year warranty. The frother is made in China. And it comes with a quick start booklet to guide the new user. Quality level is high for the money. Q: What consistency of froth comes from the VonShef Premium? A: Users report a thick froth good for a cappuccino or latte. Q: Is this a good buy for a serious coffee drinker? A: Yes, in that you will save lots of money by concocting flavorful specialty coffees at home. No, if you want to design every detail of your coffee drinks. Only higher end frothers answer such a desire. Highly functional and an exceptionally easy to operate is the VonShef Premium Electric Frother. For the money, a very good deal.